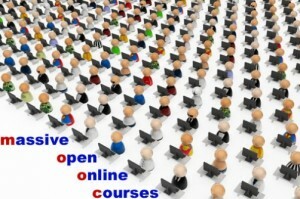 Michael A. Peters, TruthOut, August 17, 2013– The New York Times dubbed 2012 the year of the MOOCs – massive open online courses. Suddenly the discourse of MOOCs and the future of the university hit the headlines with influential reports using the language of “the revolution to come.” Most of these reports hailed the changes and predicted a transformation of the delivery of teaching and higher education competition from private venture for-profit and not-for-profit partnerships. Rarely did the media focus on questions of pedagogy or academic labor. This article suggests that MOOCs should be seen within the framework of postindustrial education and cognitive capitalism where social media has become the dominant culture. Ernst & Young’s Universities of the Future carries the line, “A thousand year old industry on the cusp of profound change.” The report suggests that the current Australian university model “will prove unviable in all but a few cases.” It identifies five major “drivers of change”: democratization of knowledge and access, contestability of markets and funding, digital technologies, global mobility and integration with industry. With the driver “digital technologies,” the report mentions MOOCs specifically as transformative of the way education is delivered and accessed and how “value” is created by higher-education providers. Clearly, this feature also is systematically related to the other features. I do not have the space here to evaluate this report except to say that it is self-serving in that it favors the privatization of education. There is no doubt that we are in the middle of an online education revolution, which offers huge potential to broaden access to education and therefore, in theory, level the playing field for students from lower-income, lower-privileged backgrounds. But evidence to date shows that the increasing number of poorly designed courses could actually have the reverse effect and put vulnerable students at an even bigger disadvantage. Higher education has always been an array of autonomous institutions, each with their own courses, their own faculty, and their own requirements for their own degrees. But online education is starting to break down those lines, in ways that are likely to lead to a lot more shared courses, consortia and credit transfers. In addition, there are a growing number of companies (not schools) providing higher education courses outside the traditional higher education institutions. As we move towards the possibility of a multi-institution, multi-credit qualification, is the traditional higher education institution in danger of losing applicants, income and identity? Traditionally, pedagogical research has been done in tiny groups; but new-generation classes of 60,000 students make it possible to do large scale testing and provide potentially game-changing research on how students learn best. Using the big data from online courses, we have access to new information about what pedagogical approaches work best. MOOCs, and many more traditional online classes, can track every keystroke, every homework assignment and every test answer a student provides. This can produce a huge amount of data on how long students pay attention to a lecture, where they get stuck in a problem set, what they do to get unstuck, what format and pacing of lectures, demonstrations, labs and quizzes lead to the best outcomes, and so on. How can we use Big Data for the good of the education profession, and not for “Big Brother”?